Zimbabwe's President Emmerson Mnangagwa, center, inspects the guard of honour during the celebrations for the country's 38th anniversary of Independence at the National Sports Stadium in Harare, Apr. 18, 2018. Zimbabwe marked another post-Mugabe milestone Wednesday - the country's first Independence Day celebration without the former leader at the helm. “Nothing is impossible. Zimbabwe shall rise again. 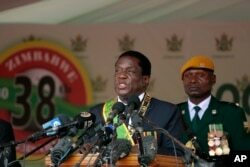 Happy birthday 38th Zimbabwe,” announced the country’s new president Emmerson Mnangagwa, ending his almost hour-long independence speech Wednesday. Mnangagwa took office in November after the country’s longtime leader and liberation hero, Robert Mugabe, resigned under military pressure. The failed economy is a top priority for the country, and Mnangagwa, who spent decades by Mugabe's side, has been quick to distance himself from the economic policies of his former boss. In his speech, the he promised reforms to help lure back foreign investors. “Once again, we are free to dream, to hope and to believe. This new spirit has spread outside our borders, and we are hugely encouraged by the goodwill our country continues to receive from around the world. This renewed domestic and foreign investor confidence has seen our projected economic growth increase from 3.7 last year to 4.5 percent in 2018," he said. Zimbabwe's President Emmerson Mnangagwa delivers his speech during the 38th anniversary of Independence celebrations at the National Sports Staduim in Harare, April, 18, 2018. Mnangagwa did not mention his predecessor, nor did he talk about some 16,000 striking nurses his deputy, Constantino Chiwenga, fired late Tuesday after they refused to return to work. Zimbabwe is headed for a key test with nationwide elections later this year. In another reversal of Mugabe-era policy, Mnangagwa has invited Western election observers to monitor the process. The president called Wednesday for political dialogue to resolve disputes. Mnangagwa’s top rival for the presidency, acting opposition leader Nelson Chamisa, was in the audience and had this to say. “The speech was not an indication of the direction we are taking. He said there are free and fair election conditions. We differ respectfully, and we are going to engage him on that,” Chamisa said. The government has not set a date for the poll, which must be held by August 22.